Happy Autumnal Equinox! Or in other words, Happy first day of fall! 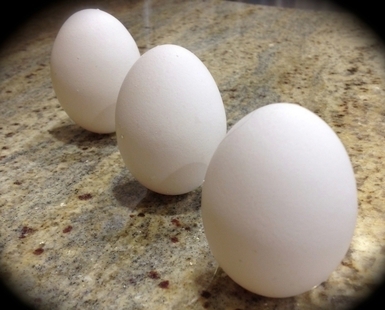 Every year around the Autumnal equinox & the Vernal equinox (the first day of spring) I hear about an old myth that states you can balance an egg upright ONLY during an equinox. According to the myth, this is because there is equal gravity between the Earth and the Sun during an equinox that changes Earths gravitational pull. Well, the truth is that there is no change in gravity from the Sun that allows us to balance an egg upright only two days out of the year. In fact, you can stand an egg upright on any given day of the year, but it does require a lot of practice....and patience. What is an equinox? An equinox occurs only 2 days out of our 365-day yearly calendar and is the time and date when the sun crosses the celestial equator, causing the stretch of day and night to be of equal length. Equinox is a Latin word meaning "equal nights". So we get approximately 12 hours of daylight and 12 hours of darkness during an equinox, twice a year. We aren't be able to feel anything physically different during an equinox, because as far as gravity goes, nothing special will happen today. The earth continues to maintain the same gravitational pull as any other day during the year. On the first day of spring and fall, the Earth's axis points perpendicular to the direction of the Sun. When the earth's axis points towards the sun, it is summer for that hemisphere. When the earth's axis points away, winter can be expected. This is what causes the seasons. In the northern hemisphere fall starts on September 22nd or 23rd and in the southern hemisphere it starts on March 20th or 21st. Fall leaves change color because there is less sunlight to produce chlorophyll. Lack of chlorophyll turns leaves bright colors like orange, red, and yellow. During fall animals like bears eat more to gain body fat and squirrels store nuts to prepare for the winter.